It’s the first commandment of painting. Here’s how to wash seven common stains off your walls. Painting instructions often warn: Remove stains from walls before painting. But they never say how. Any cleaning rookie can wipe off dust and cobwebs. 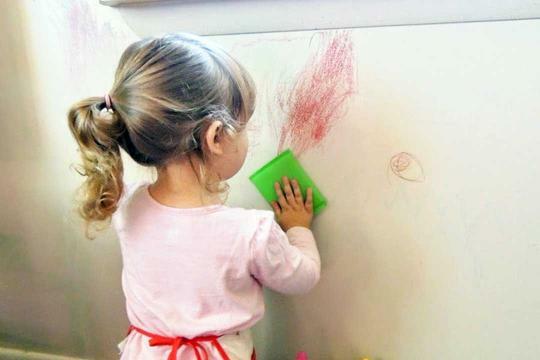 But it takes a cleaning pro to scour grease stains, watermarks, and kids’ crayon and ink wall art. Dirt and grime are part of everyday life. The oil from your hands gets onto walls, cabinets, doors, and door frames. A Mr. Clean Magic Eraser ($3 for 4 pads) easily cuts through these stains. Wet the sponge and rub gently to avoid taking bits of paint off with the stain. Or try this: Mix 1 cup ammonia, 1/2 cup white distilled or apple cider vinegar, and 1/4 cup baking soda with one gallon of warm water. Wipe the solution over walls with a sponge or cloth, and rinse with clear water. The solution won’t dull the painted finish or leave streaks. Grease is an occupational hazard of cooking; it covers cabinets and walls and attracts dirt and dust. Any good dish soap can remove grease stains on walls. For small stains, mix 1/4 teaspoon of soap in a cup of warm water, and wipe. Rinse with clean water, and blot until dry. Clean stubborn grease stains with solution of 1/3 cup of white household vinegar with 2/3 cup of water. Ballpoint ink, which is oil-based, often succumbs to foaming shaving cream, dry-cleaning solvents such as Carbona, or nail polish remover. Make sure you open windows when using cleaning solvents and polish remover.